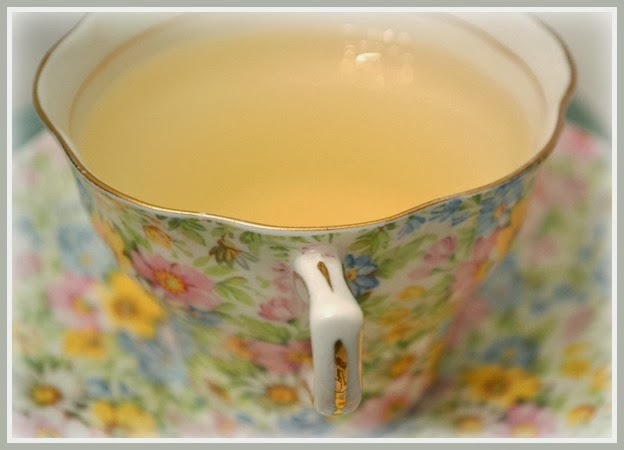 Artful Affirmations: Tea Cup Tuesday-Stormy Day brings Calls for Chintz! Tea Cup Tuesday-Stormy Day brings Calls for Chintz! It has been snowy and rainy since last week. We are expecting more of each soon! All this topsy turvy weather turns my mind to Chintz! Tea time is all the more important during these changeable conditions. One of my own concoctions. up in my art room over the garage. Let steep about 5 minutes. No need to remove the ginger, it just floats to the bottom. I do not eat them, but you sure could. they become warm, soft and extra delicious! Longton, Stoke on Trent, England...sometime after 1952. Crazy weather out your way? and some of us need it to stop raining. Do you have an unusual drink for your tea cups? where she has a delicious chocolate fudge cake! Last week was a blast! Chintz is so pretty. No wonder it is so popular. I actually don't even own any though. And when I get it in my shop it sells immediately! Our weather continues wintry but that is ok. Lots to do in the house where it is cozy and warm. Beautiful chintz teacup and yes, very cheery for a cold and snowy day! Thank you so much for the lovely tea party, makes me feel like having some tea right now! I love chintz and your teacup really is a beauty! 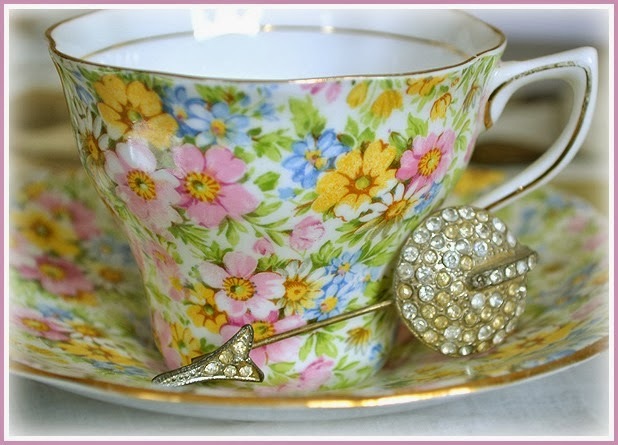 I agree, chintz always brightens your tea time because it is so pretty and brings to mind the thoughts of summertime. Ginger and apple tea sounds perfect. My son always uses fresh ginger to make a concoction whenever he feels a cold coming on. It is really tasty. Thank you for sharing your sweet teacup and your tea recipe. Stay warm and snug. That cup and saucer is really lovely. I have a couple Rosina ones and yours is exceptional! Yes chintz patterns are one of my favourites too. I have just a few pieces! That fresh ginger, apple and honey tea sounds right up my alley! So good for you dear friend! We are drinking our own apple peelings tea at the moment - so very good for your health! Warm hugs on a snowy and rainy day to you! I really like your Rosina chintz teacup. It really makes us think Spring! Raining here today and I won't complain -- we were dropping back into drought. It's the cold wind I don't like. Stay warm with your delicious sounding ginger tea! Happy Tea Day! thank you for the recipe of your liquid sunshine. I love to drink fresh chopped ginger with hot water against the cold. It makes warm and a good mood. But the idea to add apple bits and honey is nice. I will try that next time. Your Chintz tea cup is so springy. I am craving for spring. Here the weather is mild, no sunshine, no storm, no snow. Thank you for sharing this wonderful tea break and for hosting this sweet event. Love your chintz teacup! My sister just gave me two chintz teacups she found at a garage sale! I will have to try your tea! Terri your teacup was a breath of spring and the warmer temps that are just around the corner - I'm so ready to say good bye to the tres cold temps! Thank you for hosting... hugs C.
Hello Terri, thanks for the party! So tired of winter, but your sunshine filled post was a bright spot in my day. Your lovely teacup reminds me of my grandmother's snack set that I am lucky enough to now call my own. While it is not chintz, it is covered with sweet yellow daisies. Maybe I should bring it out to brighten up a winter in NJ afternoon. Your chintz tea cup is lovely. Ginger is so warming, a good idea for cold, wet days. Here in Michigan it is 16F, with more snow expected. Can't remember a winter with so much snow and consistently freezing temps. Tea is a good idea! Hi Terri, I'm back! Thank you for having me at your lovely tea party again! That is a beautiful teacup Terri! I love chintz. My Dad used to have Sassafras tea. We would take the wood chips and steep it in a pan of boiling water. It was pretty good. Your ginger tea sounds delicious! Beautiful! I am going to try that delicious tea! Here on the west coast we are in need of some rain. The mountains have a much-reduced snow pack and that spells serious water restriction by early summer. It seems that it rains a lot here, but not enough of the rain soaks into the earth because this island is really just a big rock! I'm so glad to have visited your blog today, to see your beautiful teacup and read the recipe for a lovely-sounding tea. Chintz certainly is delightful! Your Ginger tea sounds delicious. Great way to warm up a dreary day. Snow on the ground, but sunny here today. Happy to be joining! Hi Terri, your recipe sounds wonderful and I will be trying it out as our new season apples begin to appear at the farmers' markets. 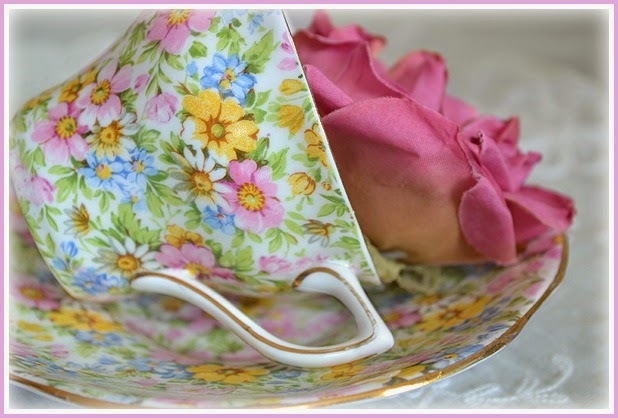 Your chintz tea cup is a great way to welcome in an early spring...one can only hope! 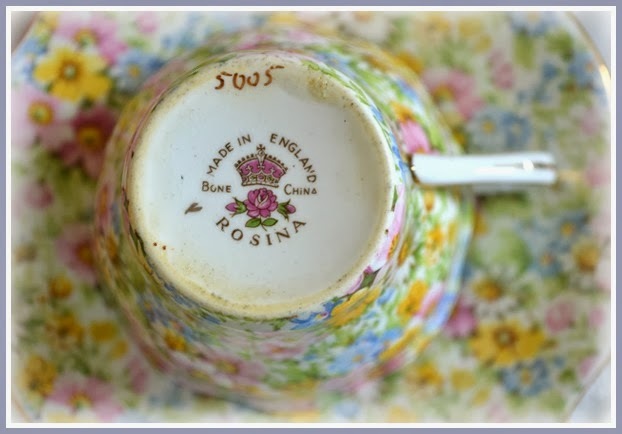 We seem to be thinking along the same lines ( or teacups ) as I have a Rosina teacup in my pile of pink teacups. It is the only Rosina I own, but I can sure see the appeal, especially in the teacup you displayed. I like to drink plain ole hot water - sometimes a slice of lemon! Is that unusual? A cheery, beautiful teacup! I will have to try that tea! Your tea sounds great, you are always filled with wonderful ideas, and that teacup is glorious! Bad weather up this way too, I am tired of it already! Hugs to you, will talk soon. Thank you Terri and Martha, for this wonderful tea party. Your ginger and apple concoction is so refreshing. Nothing is more perfect for winter than a warm sip of ginger tea. Good for sore throat and cold. Hope the snow will ease sooner than later. I think I've said this before but I just want to say it again. I love the teacups, and the tea sounds delectable but I'm most taken by the beautiful way you take the photographs. They are truly exquisite! Super charming Terri....such gorgeous chintz..the colors so uplifting and full of Spring and Summer..and your photos are a poetic- feast always! Yummy..I have fresh ginger tea almost daily..but your recipe sounds so delightful and inspiring..the bits of apple sound divine..!Ginger is one of my faves..so I will have to try your version sometime soon ! Thanks kindred!